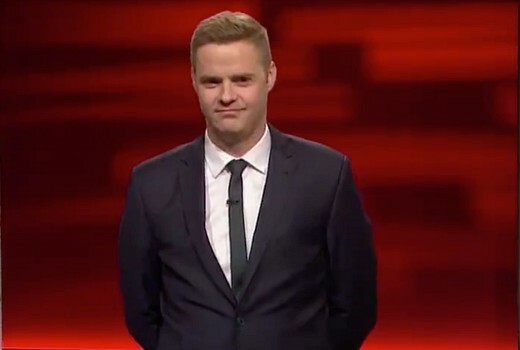 Tom Ballard will this evening host a complete episode of Tonightly that has been rebadged as Conservatively…. As this selection of items illustrates, it will attempt to put some balance back into the ABC that its critics reckon has been absent. Executive producer Dan Ilic tell TV Tonight it will include a Lefty Boot Camp package from Jazz Twemlow on how the left aren’t cool any more. “We’ve commissioned a piece from a conservative comedian based in Adelaide, James McCann who is arguing for the defunding of contemporary art spaces like the new NGV. Tom Ballard will be doing an entire monologue from a right wing perspective,” he says. The show’s final live episode is on Thursday. 9:30pm tonight on ABC Comedy. If this episode turns out to be genuinely funny (and I hope it does), maybe it will suggest to the show’s producers that the best way to get at your enemies is to take the piss rather than a full-frontal assault with foul language. Rather like “The Games” or the UK’s “W1A”. Speaking of the latter, it’s sad that we won’t see its equivalent on Australian television because the ABC are such delicate little petals. Otherwise Working Dog could have called it “Ultimo” rather than having to disguise it as “Utopia”. Yeh right. So it’s 159 episodes prompting left wing opinion and 1 episode mocking conservatives to prove they are balanced. Fairly typical ratio for the ABC. Tonighly was intentionally highly left wing to appeal to younger people who are more radical. And 30,000 of them loved to watch it every night. It is more likely to be mocking conservative politics than providing a genuine conservative point of view. They did this before when they had Greg Larson pretending to be a right wing stand up comedian in one particular segment. Au pair … sorry, ‘contraire’ 😉 – Tom will probably treat it as seriously as any conservative comedian would.